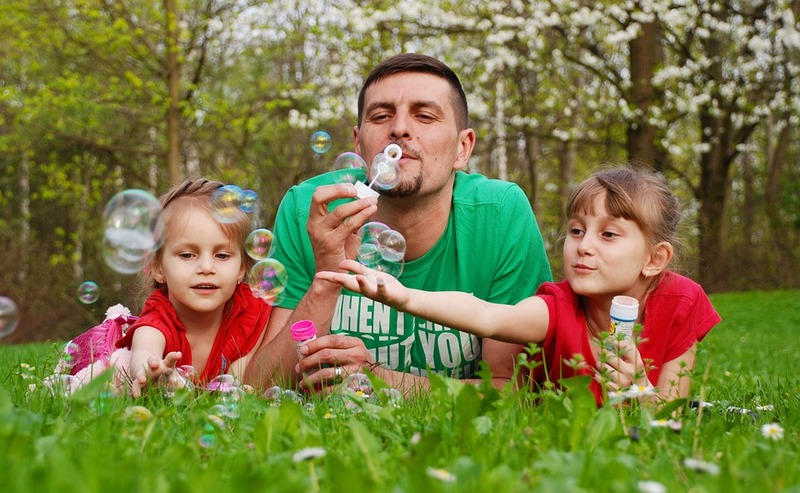 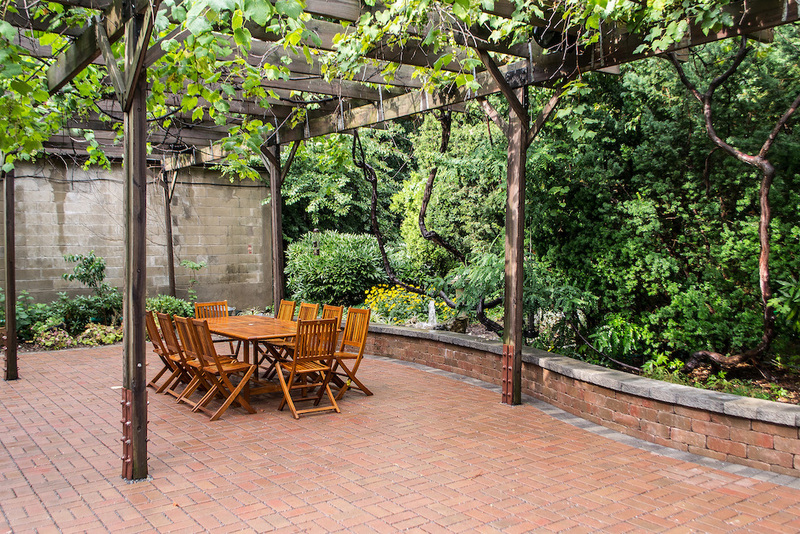 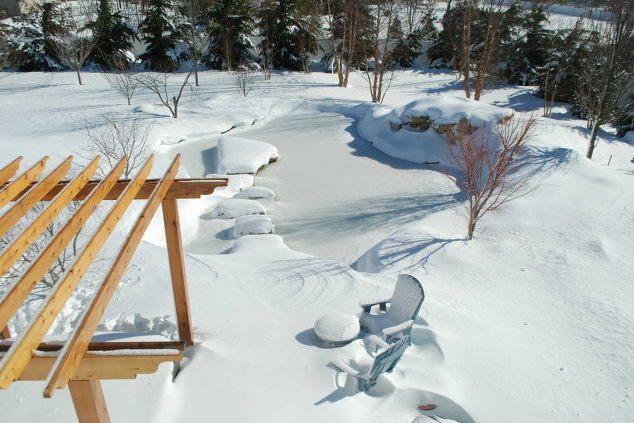 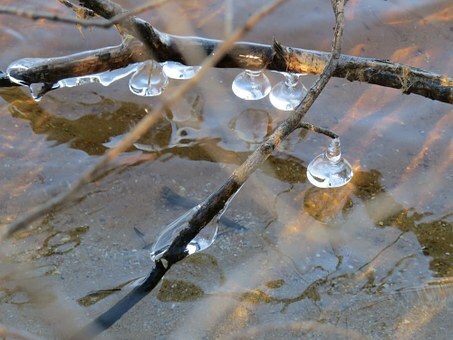 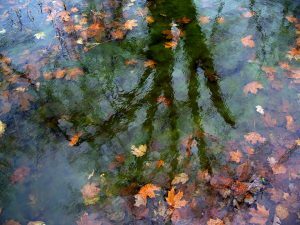 Testing the Waters: Will Our Family Enjoy a Natural Swim Pond? 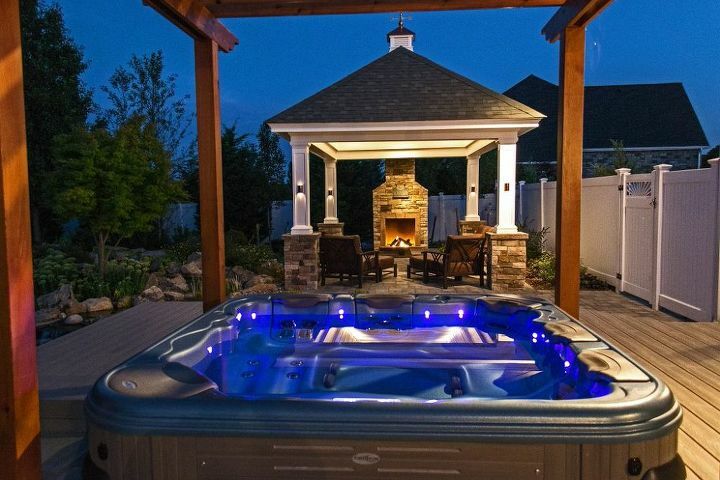 Most people are pretty certain their family will enjoy using a regular swimming pool. 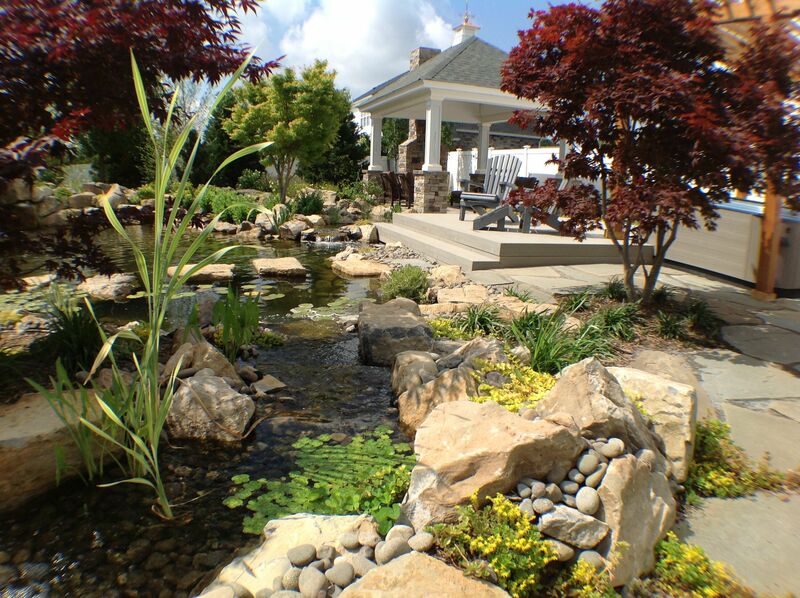 But a swimming pond? 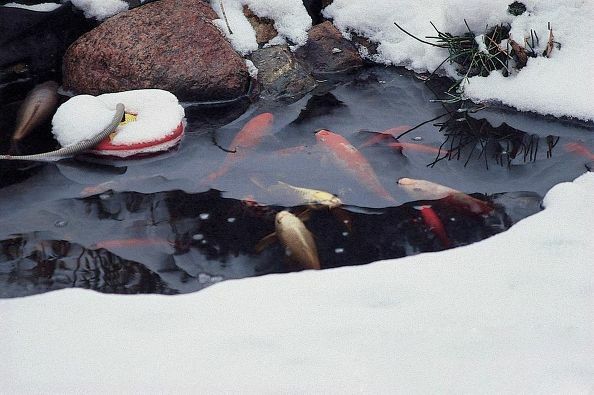 Not everyone is so sure. 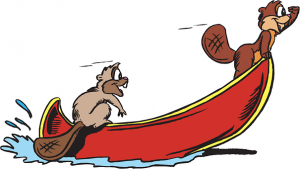 One way to test the waters so to speak is ask yourself this question: Do we like swimming in lakes, the ocean, and swimming holes? 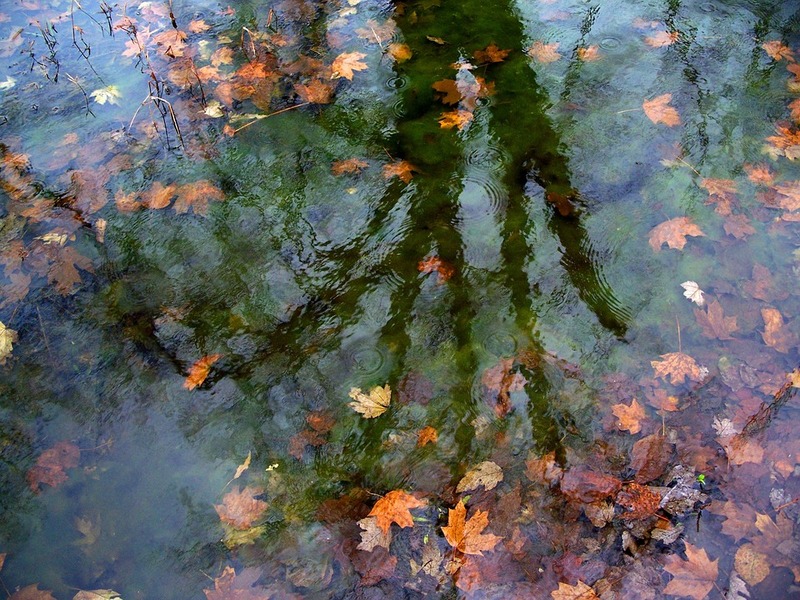 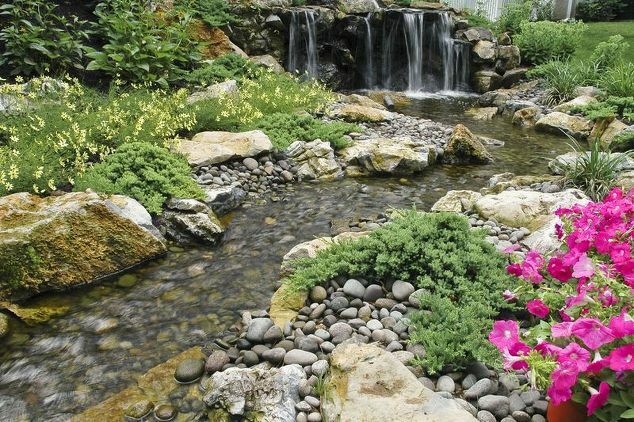 If the answer is yes to any of these, then, you’ll probably love a natural swimming pond. After all, families swimming in the ocean have probably brushed up against the occasional bit of seaweed and snorkeled to get close up to colorful fish. 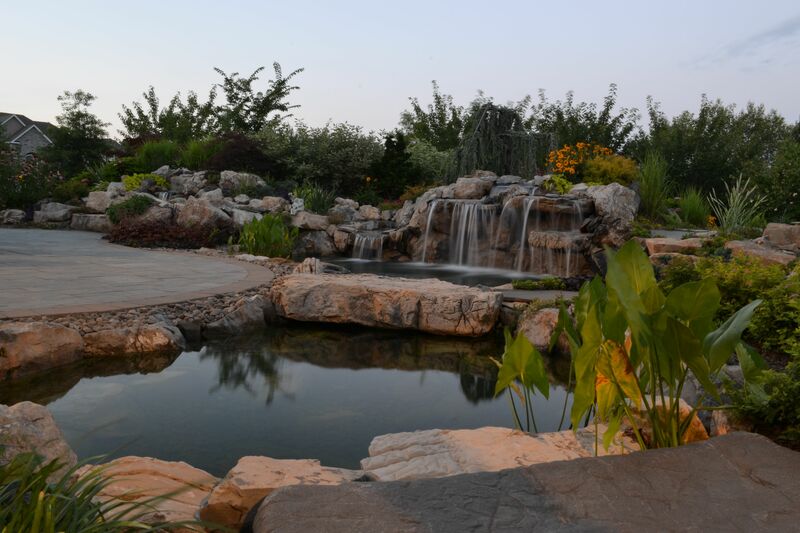 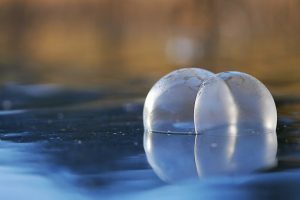 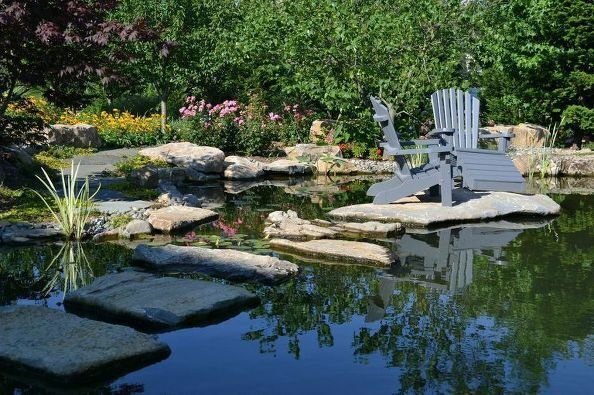 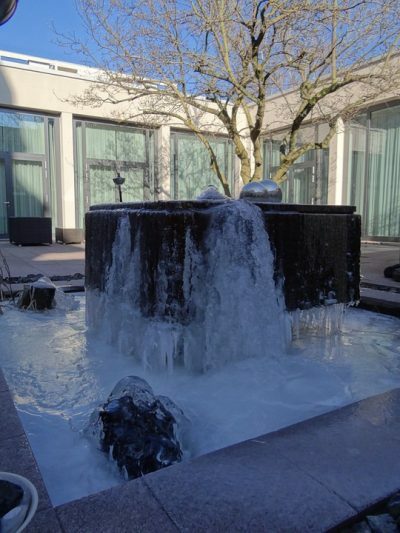 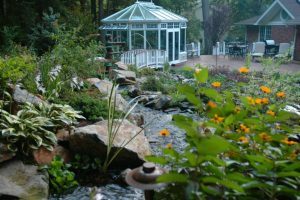 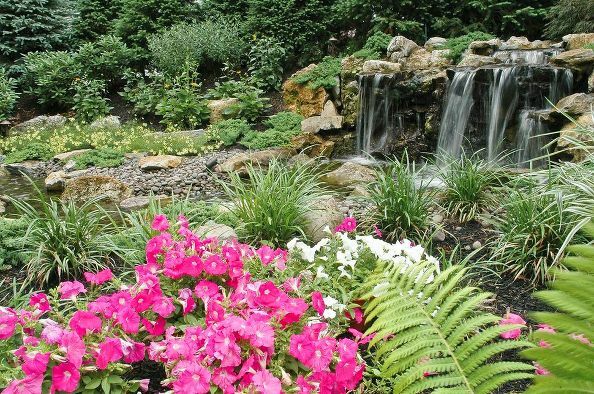 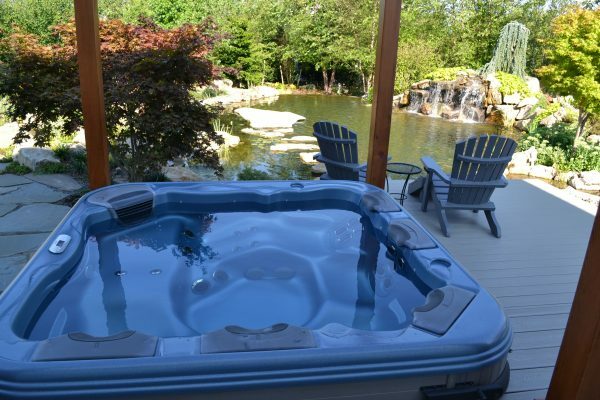 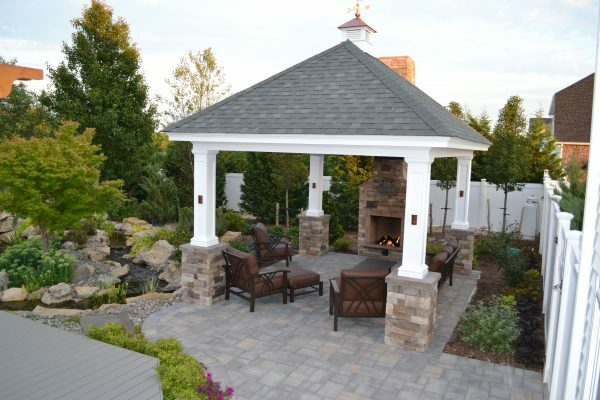 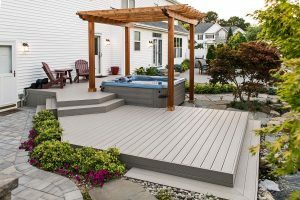 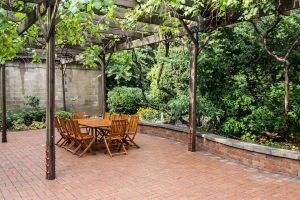 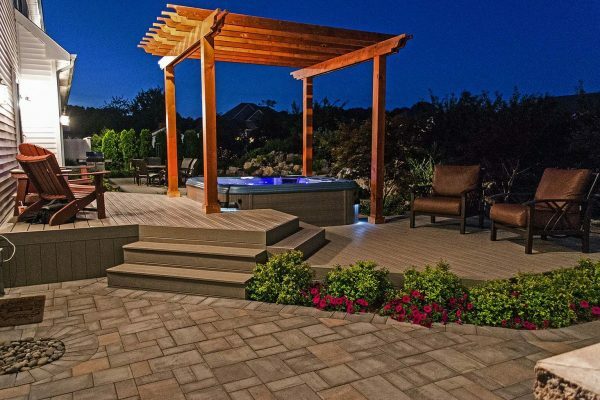 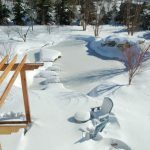 So would it surprise you that in recent years, Deck and Patio (already known as pond experts on Long Island) has been asked to create several man-made ponds — designed especially for the clients’ swimming enjoyment? 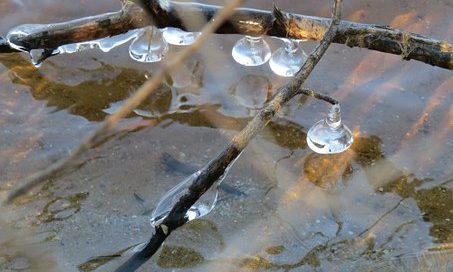 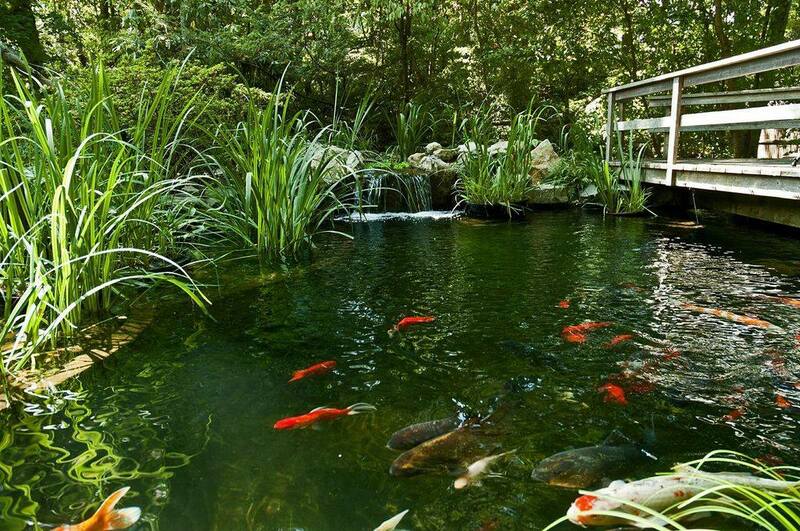 ponds are better than TV or video games. We would have to agree with her. Snorkeling in a regular swimming pool isn’t all that exciting. 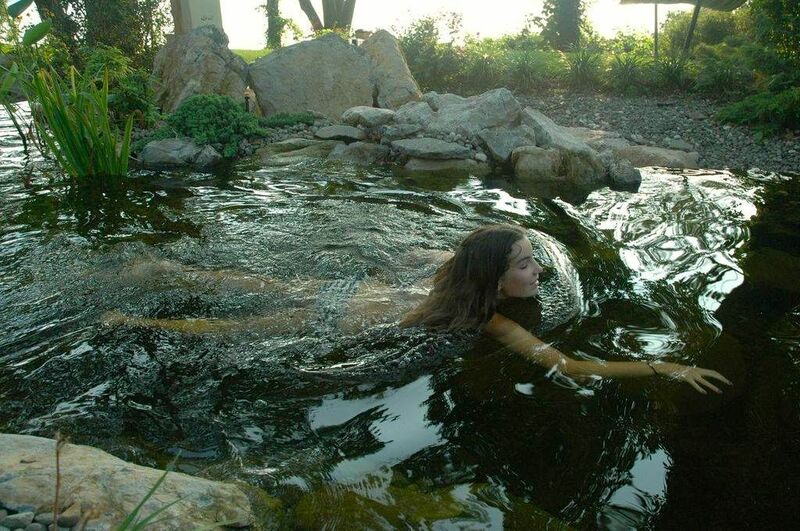 That aside, swimming in a pristine natural pond is very possible and thrilling. 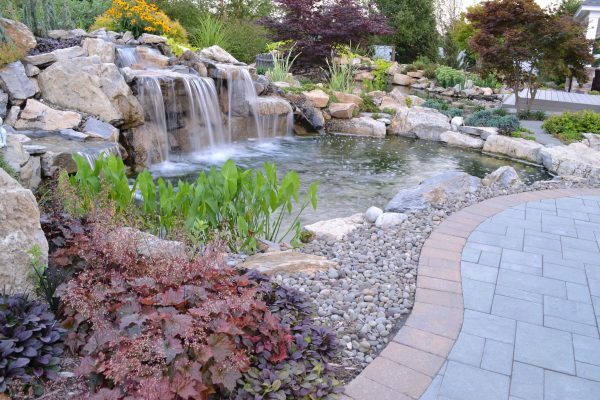 Using the right underlayment, liner, Biofalls and skimmers, bog filtration and water plants are all part of creating the perfect experience. One great example of a swimming pond was this Deck and Patio project in Brooklyn. 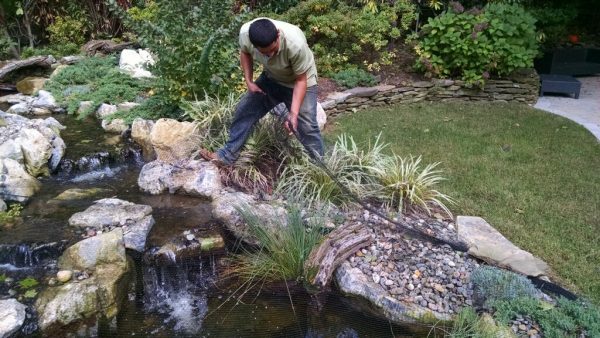 The heart of the project is, of course, its eco-friendly pond, which we built initially as a very shallow pond — only 8” deep. 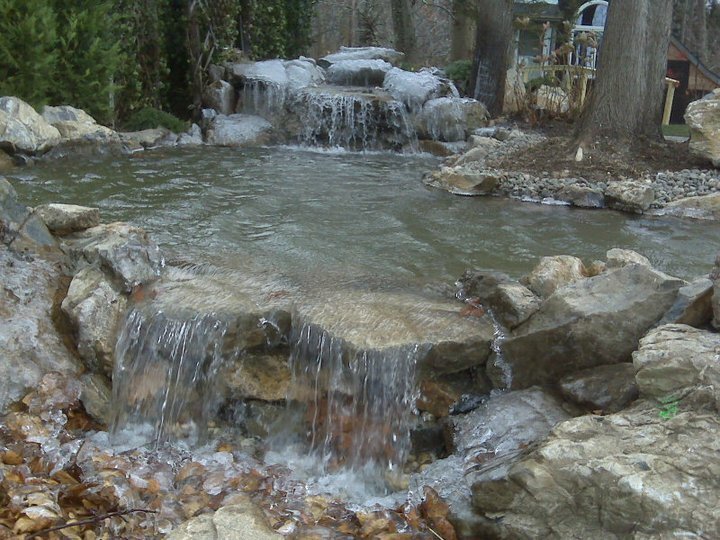 That was deep enough so their young children could swim and play in it. However, we also constructed the pond to “grow” with them. 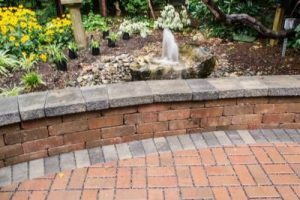 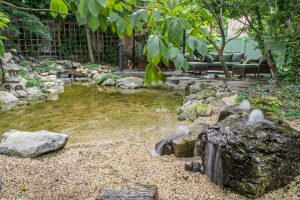 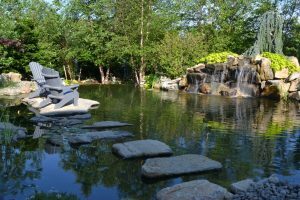 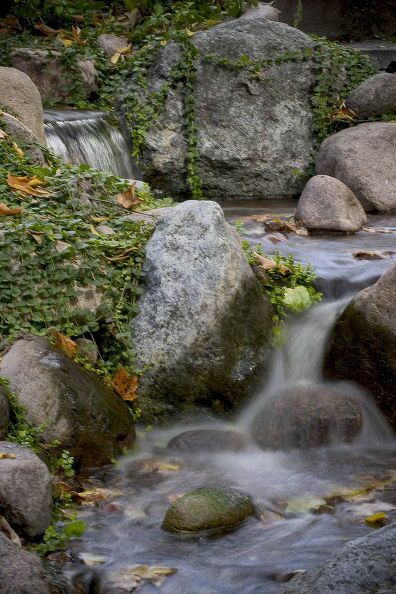 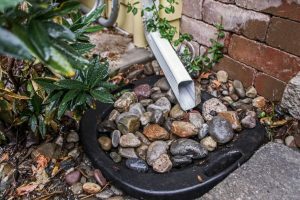 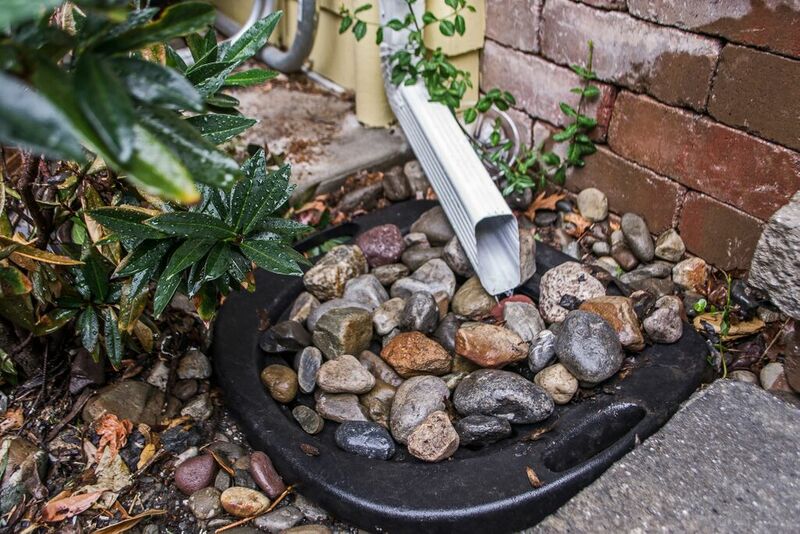 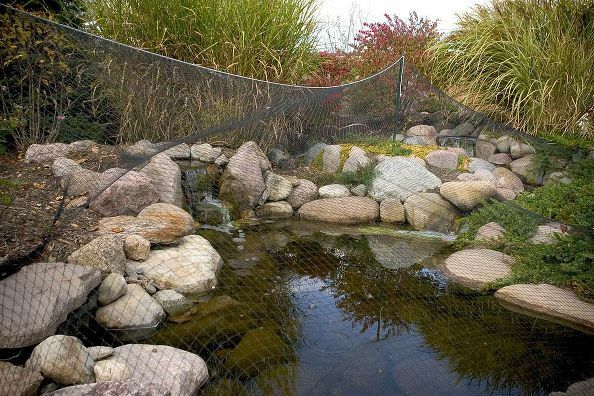 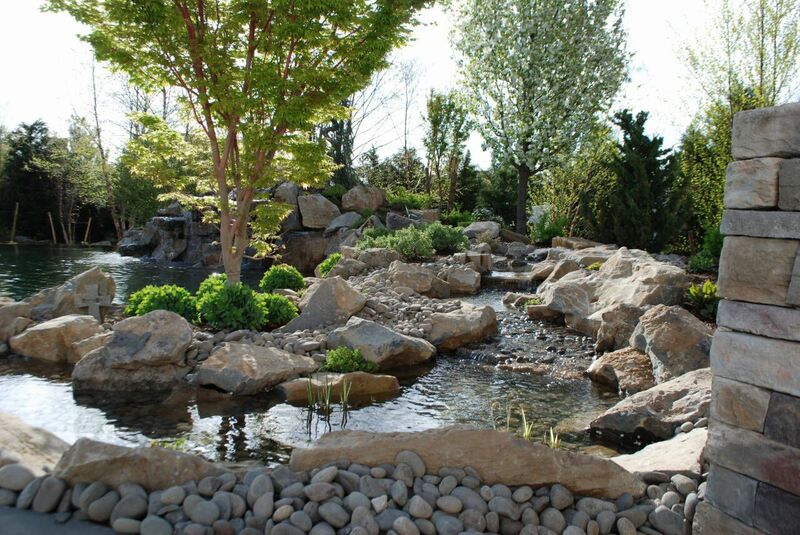 We used boulders that are covered with fabric and gravel which, when they got older, could be removed — exposing a full-sized pond they can stock with koi — offering an entirely different experience for more mature children. 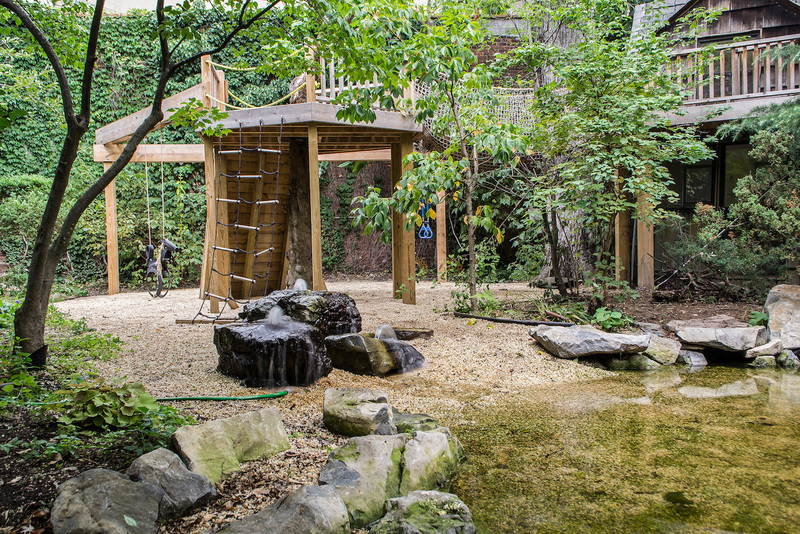 The finished natural playscape is reminiscent of a secret cove on a desert island. 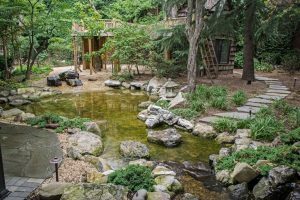 It boasts a swimming pond with a beach-style entry, three waterfalls, a rock climbing wall, a pirate-ship-style tree house, rope bridge, swings, exercise rings/bar, and three bubble-rock water features. 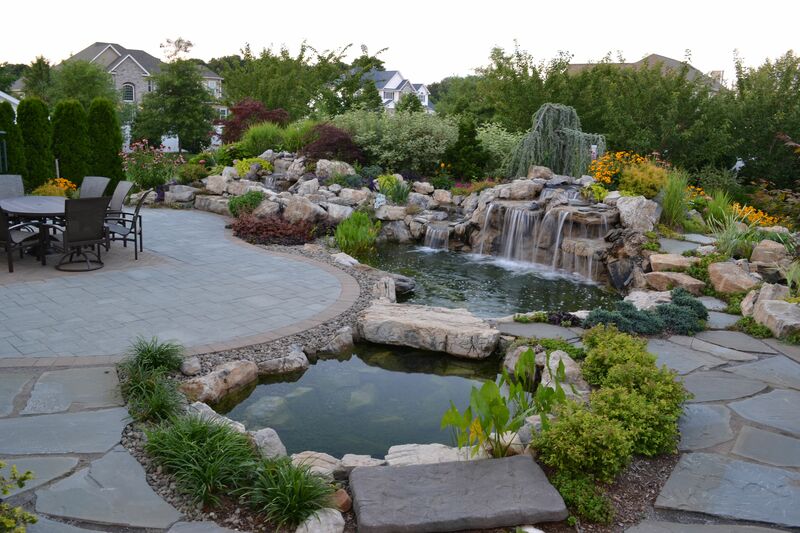 This pond is one of two ponds the clients had us create in their yard which overlooks Long Island Sound. 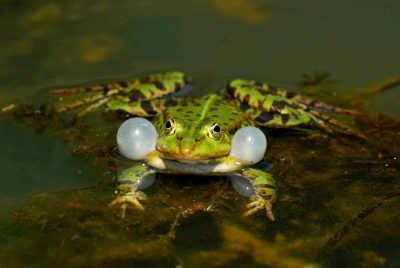 Now you may think that our beautiful model is avoiding the ‘ewwww’ factor by using a floating device. But as you’ll see from the next photo below, she’s not bothered at all by healthy pond life. 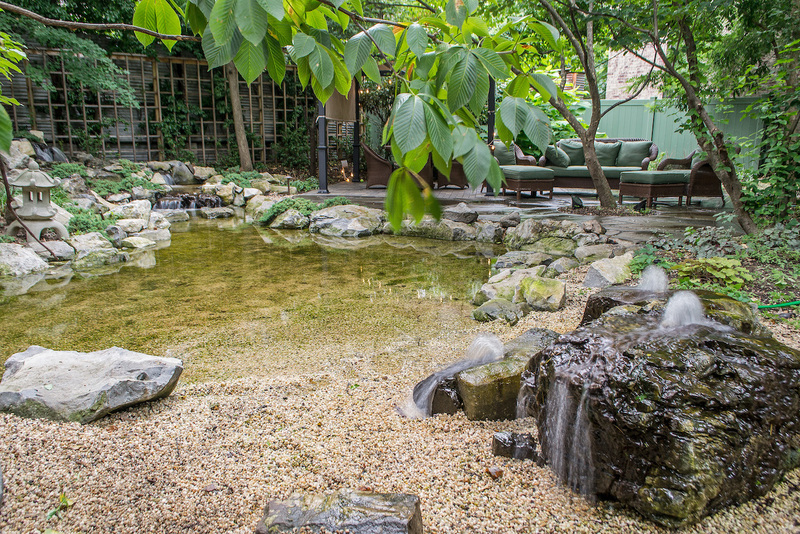 Indeed, this pond is pure and clean — a joy to swim in. 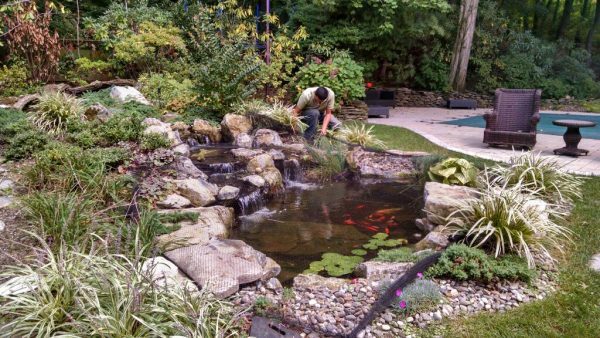 A key factor in a good natural swimming pond is to build it big and deep enough so that you can snorkel as well as have room to swim. 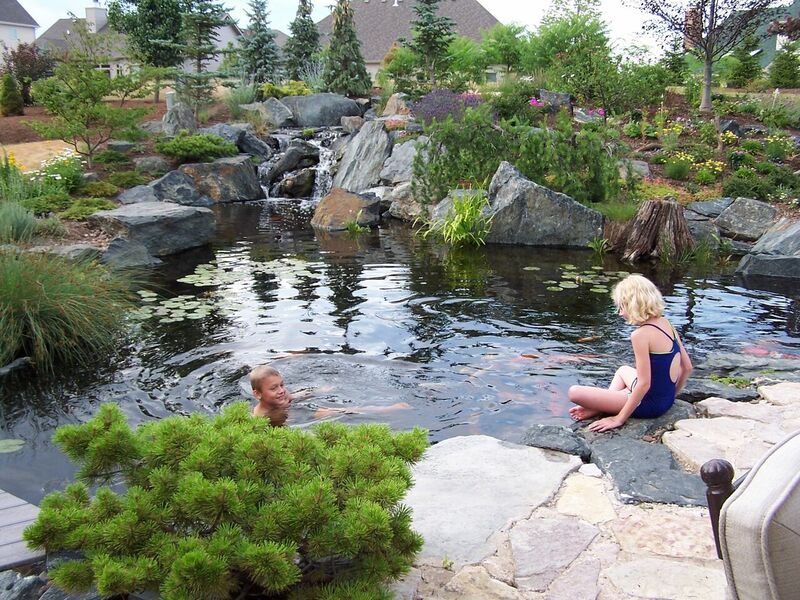 The child in all of us loves natural swim ponds. 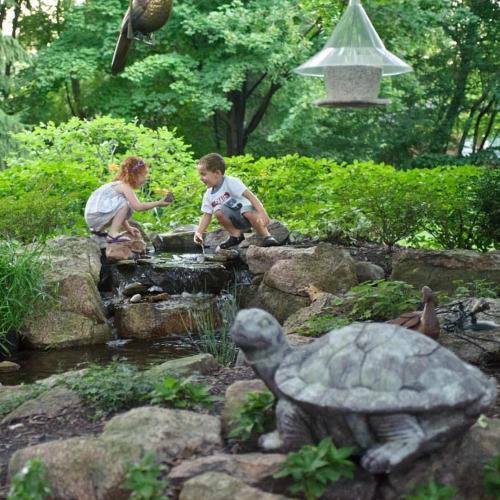 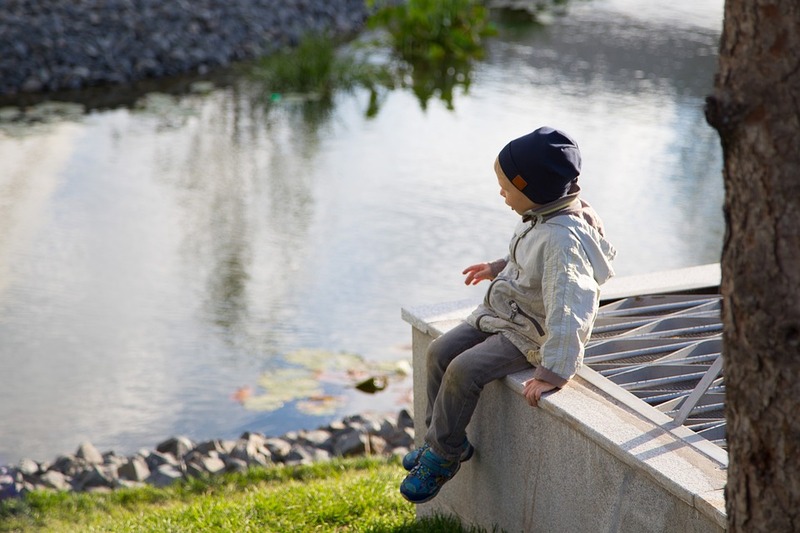 This photo was published originally by a homeowner who wrote an Aquascape Inc. blog “Growing Up Around a Pond.” She captured her son in the photo encouraging a friend to join him in the pond. 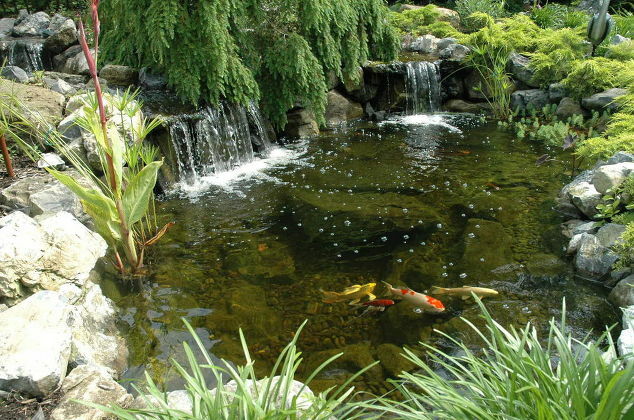 Some ponds, like this one, is intended as a koi pond and not a natural swimming pond. 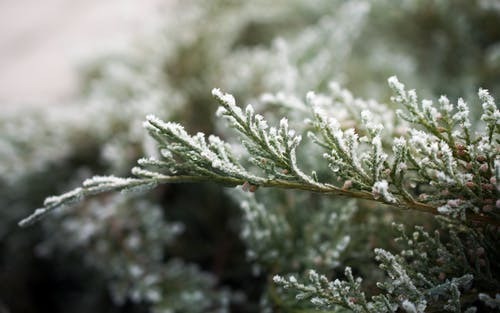 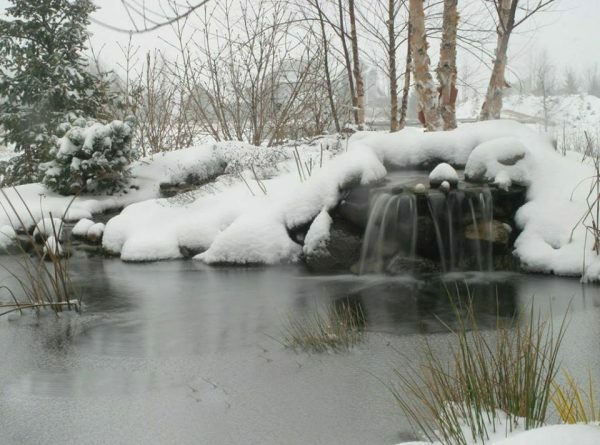 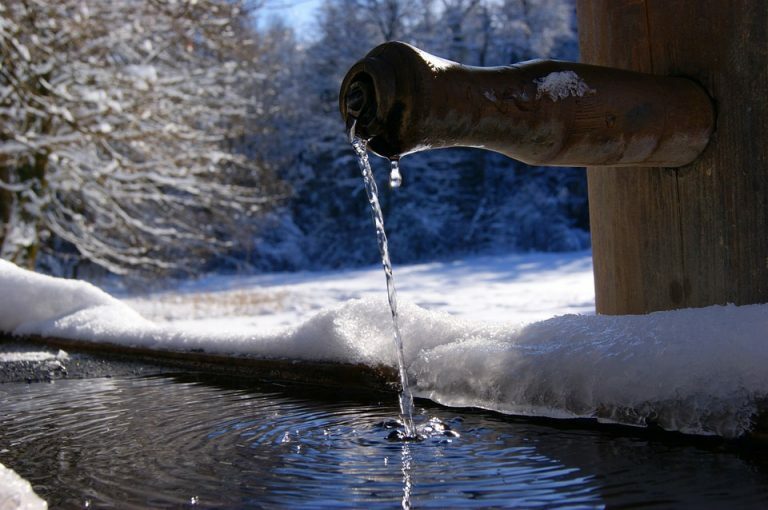 One ways you ensure a pond is sufficiently pristine for swimming is not to overload it with koi or other pond fish. 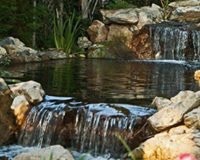 This allows the aquatic plants and natural filtration systems the ability to absorb and “clean” the pond sufficiently for an enjoyable swim. 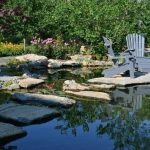 By June Sullivan|2018-01-11T15:19:58-05:00January 11th, 2018|Aquascape Biofalls, Backyard Escapes, Backyard Refurbishments, Backyard Resorts, Backyard Upgrades, Creative Design, Design and Build Experts, Koi Ponds, Living Landscapes, Natural Swimming Ponds, Outdoor Living, Plantings/Pondscapes, Ponds & Water Features, Pool Upgrades, Pools & Spas, Sustainable Water Features, Unique Ideas|Comments Off on Testing the Waters: Will Our Family Enjoy a Natural Swim Pond?